Julia Computing was founded in 2015 by the co-authors of the Julia programming language to help private businesses, government agencies and others develop and implement Julia-based solutions to their big data and analytics problems. Julia is an open-source language for high-performance technical computing created by some of the best minds in mathematical and statistical computing. Reid Atcheson, Accelerator Software Engineer, NAG, and Andy Greenwell, Senior Application Engineer, Julia Computing, have teamed up to ensure that NAG Library routines can be called from the Julia language. Read their piece here. Analysis of performance optimisation service requests: what kind of codes are we helping as part of POP CoE? NAG is a partner in the Performance Optimisation and Productivity Centre of Excellence (POP). POP was created with the aim of boosting the productivity of EU research and industry by providing free of charge services to advise on improving the performance of high performance computing (HPC) parallel software. The POP team consists of six partner organisations from Germany, France, Spain and the UK. Over 30 codes have applied for the POP service so far since its kick-off in October 2015. I decided to have a look into the details of what types of codes POP is working with and see if any interesting themes emerge. Since this is quite early in the project it will be useful to revisit and see how it evolves over time. First I decided to look at what languages all of the codes were written in. 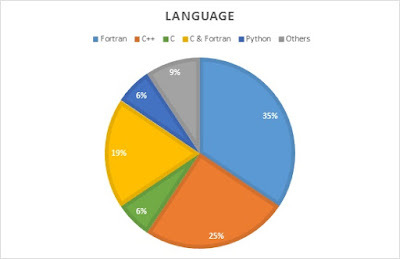 From my experience in Physics, I generally assumed that Fortran was the most prevalent language in academic/scientific applications. NAG and Continuum have partnered together to provide conda packages for the NAG Library for Python (nag4py), the Python bindings for the NAG C Library. Users wishing to use the NAG Library with Anaconda can now install the bindings with a simple command (conda install -c nag nag4py) or the Anaconda Navigator GUI. For those of us who use Anaconda, the Open Data Science platform, for package management and virtual environments, this enhancement provides immediate access to the 1,500+ numerical algorithms in the NAG Library. It also means that you can automatically download any future NAG Library updates as they are published on the NAG channel in Anaconda Cloud. Who are the Customers of NAG's Impartial Expert HPC Consulting? One of the questions I get asked most often while out and about in the HPC community at conferences, or visiting (prospective) customers is: "Who are your HPC consulting customers?". The simple answer to that is most prefer to remain confidential, because they see a competitive advantage from using our HPC advice or services. There are a few we are very proud to be able to name. For example NAG has worked with EPSRC to provide the Computational Science and Engineering Support Service as part of the HECToR national supercomputing service, and to provide independent expert advice on the technology options and procurement for the UK's national academic supercomputers (HECToR and ARCHER). We enjoyed working with our friends at Red Oak Consulting to support the KAUSTShaheen II supercomputer procurement recently - see our joint press release. 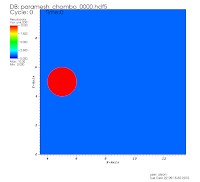 The NAG Library contains routines for solving the partial differential equations specific to compressible, ideal fluid flow. These equations are generally written in conservation law form where the conserved quantities are mass density, momentum and total energy of the fluid. This set of equations can be solved using a finite volume technique that considers each conserved variable as a volume average over a finite volume (typically a small cube) and sums the fluxes (flow rates per unit area) computed at the faces surrounding the volume to get the total rate of change of a particular variable for that volume. On International Women’s Day we are delighted to publish an interview with NAG Placement Student, Heather Briggs, in which she speaks about her time at school, what led her to her degree choice, and the challenges and highlights she has experienced along the way. Heather, can you tell us a little about your school days – which subjects were you drawn to and did you receive encouragement from your teachers to continue with these into higher education? Recently, I attended the Alan Tayler Day at St. Catherine’s College, Oxford, organised by the Smith Institute. 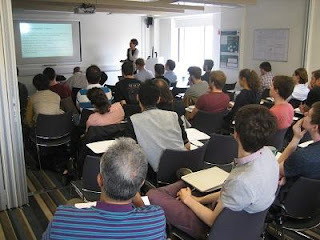 One of the speakers was Dr Rebecca Killick, of Lancaster University, whose talk highlighted her collaboration with NAG that has led to the inclusion of the PELT algorithm into the NAG Library. Dr Killick's collaboration with NAG started in her student days, when she was the runner-up in the "Take Aim" competition, another event run by the Smith Institute and, this year, sponsored by NAG along with Babcock, BT, CATAPULT Satellite Applications, ESPRC, Experian, GCHQ and National Nuclear Laboratory."